So apparently rubber-band bracelets are all the rage at our local elementary school. My nephews must have begged their mom for some and when she text’d me about it I quickly asked her to buy some packs for the girls as well. $1.99 at Michaels craft stores (Don’t ask me where, I walked around that place for an hour yesterday looking for halloween decorations and never once saw them). The kids had been hooking and linking the rubber-bands together and it produced a gnarly looking bracelet. I remembered finger-knitting and with a quick search on youtube I found out about “fishtail” rubber band bracelets using the finger-knitting method basically. I don’t know if its technically finger-knitting, you will have to ask Anne Weil as she’s far more of a finger knitting expert then I am! Before I could blink, BG was making her own and it was much easier then the other method of shoving the rubber-bands through one another and trying to hold it folded in half while shoving another one through, and more importantly the bracelet looks a lot better in fishtail style. Place a rubber band around your two fingers, but twist it in the center making a figure 8 around the fingers (it should cross in the center). Place a second rubber band over your two fingers DO NOT twist. Place a third rubber band over your two fingers DO NOT twist. Lift the bottom most band on one of the fingers, up and over essentially taking it off, and it will sink down in between them. Repeat on the second finger. Repeat steps 3 and 4 until desired length. The little kits come with little plastic jump rings. When you are finished and it is the length you want it, add two more rubber bands to the length. Then slip it off your fingers and REMOVE those two bands, this will leave loops for you to thread into the jump ring. 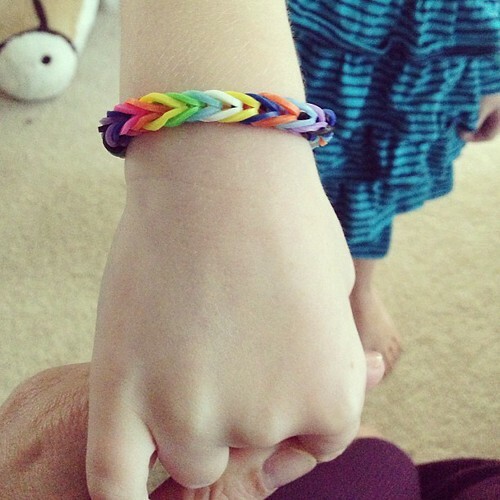 From what I’ve read you can create the fishtail style bracelets with the rainbow loom. I don’t have the loom and have never seen one. I was just happy to find a super low-fi solution that didn’t involved spending a ton of money. Not your traditional finger-knitting, but knitting with rubber bands and your fingers nonetheless! My daughter and I tried this today and had so much fun! Thanks for the directions. Fantastic 🙂 I was worried I should have posted video. Glad the instructions made sense! This helped alot. 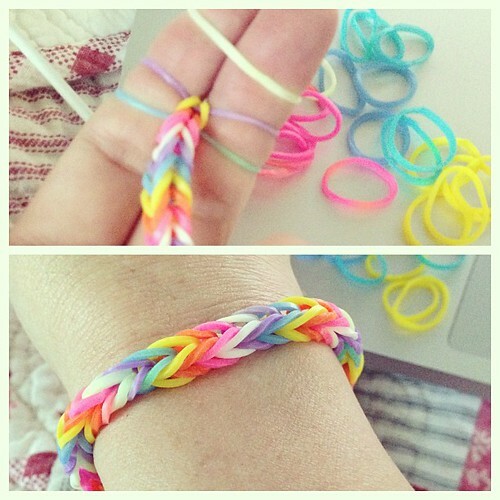 I know how to make the string bracelets too. When i bought the rubber bands, they said they were scented and the only thing it smells like is fruit loops and rubber tires. Just wondering if know about how many bands it takes to make this type? 20, 40? I love making these!! It’s so much fun. I know how to make this, but could you make any others??????????????????? how many rubber bands do we need to make a fishtail? Where do I get the kits? I have found the packages of bands with the tiny connectors at craft stores such as Michael’s and other various craft shops. Does anyone know how to make one without the crappy ends like the double loop ones? Once I made them, I couldn’t fix them. will you post more like starbersts. I Already Knew How To make it i juust wanted to see if any website did it a different way than me but thanks anyways you uys are helpful !. this was so easy now i know how to make them all of my friends at school now i can tell them i can make them to thanks so much!!!!!!!!!! Here is a link for 6000 bands (10 colors) and plenty of clips too on amazon. you need 2 looms to do some bracelets and charms. This helped but I was wondering if there are other ways to “finger knit”,I know there is the original way, and the fishtail, but are there other ways to make a bracelet without a loom? I’ll have to experiment with this.